Baghdad (AFP) - Iraqi forces retook an area west of Ramadi on Saturday as they pressed their operation aimed at sealing off the jihadists who captured the city two weeks ago, commanders said. "The Iraqi army and the Hashed al-Shaabi liberated the Anbar traffic police building in the 5K area west of Ramadi after a fierce fight," an army officer said. Hashed al-Shaabi ("popular mobilisation" in Arabic) is an umbrella for mostly Shiite militia and volunteers that has played a key role in Iraq's fight against the Islamic State (IS) group. "The battle forced IS to withdraw from the building, which they had used as a base, and pull back into Ramadi city," the officer told AFP. 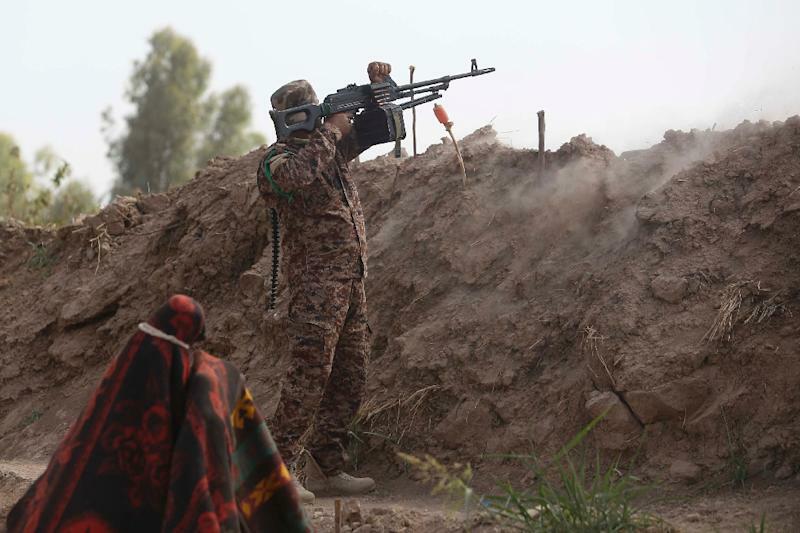 Iraq forces have launched wide operations aimed at severing the supply lines of the jihadists who control most of Anbar, a vast Sunni province in western Iraq of which Ramadi is the capital. "The security forces today are tightening their stranglehold on Ramadi, from the traffic police building to the west, from the university to the south and from the other sides too," Anbar police chief Hadi Rzayej said. He said ordnance disposal teams were busy removing roadside bombs and checking buildings for booby traps in reconquered positions on the outskirts of Ramadi. Iraqi government and allied forces retook the southern districts of Taesh, Humeyrah and the Anbar university compound earlier this week. The jihadists seized Ramadi on May 17, using an unprecedented wave of suicide vehicle-borne bomb attacks to force a retreat from the forces that had managed to hold some positions in the city for more than a year. An army colonel said IS unleashed eight suicide car bombs on a military base in eastern Anbar Saturday. Forces equipped with anti-tank systems were able to stop all of them, he said. "Army forces managed to repel a Daesh (IS) attack involving eight vehicle bombs driven by eight suicide bombers," said the colonel at the base in Al-Shiha, about 50 kilometres (30 miles) west of Baghdad. He said they used Kornet anti-tank guided missiles "recently delivered to the security forces". The United States also announced after the fall of Ramadi that it was sending 2,000 Swedish-developed AT4 unguided anti-tank weapons to help the Iraqi forces counter the threat of car and truck bombs. As they attempt to isolate Anbar from other provinces, Iraqi forces have also been fighting in Salaheddin province, whose capital Tikrit was recaptured two months ago but where IS still holds territory. Federal and Hashed al-Shaabi forces have been making progress in the Baiji area, around 200 kilometres (120 miles) north of Baghdad, which commands access to a key road leading to western Anbar.